Since our inception in 1999 under the umbrella of Abe Brown Ministries, New Hearts Outreach has been offering the hope of the gospel love of Jesus Christ to those who choose to pursue sexual and relational wholeness. Specifically, we recommend a 3-fold approach to recovery: one-on-one discipleship and healing prayer; weekly confidential support groups with accountability; and referral to licensed Christian counseling. The ministry offers a number of weekly support groups, and our staff meets regularly with individuals for discipleship and inner-healing prayer. 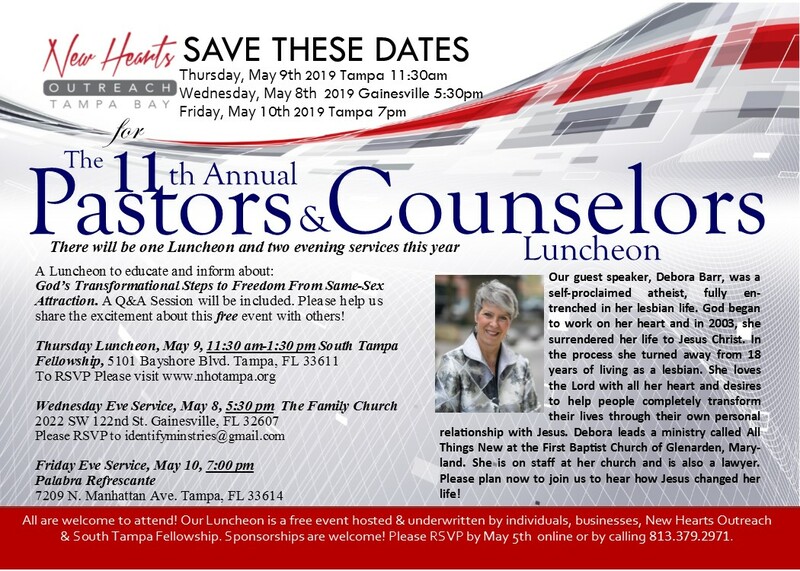 Also, we are a frequent resource to counselors, pastors, churches, schools, conferences and businesses in need of speakers, trainings and the like. We are presently in an exciting partnership with the growing international Underground Network, which consists of over 160 micro-churches serving the poor, needy, hungry and disenfranchised around the world. Additionally, we are affiliates of the Hope for Wholeness Network, and the Tampa Bay affiliate of PFOX as well as the Restored Hope Network. If you have questions call our Confidential Voice Mail Line-(813)248-9772-leave your name and number and staff will call you back.